Podcasts have become so commonplace in 2018 that many of their 73 million monthly U.S. listeners may not realize that the concept of podcasts was born in the 1980s. By September 2000, listeners heard downloadable news and entertainment episodes on their MP3 players. But it took until September 2003 for the first Harvard blog containing 25 audio interviews to be released to listeners via a feed. Podcasts weren’t initially known as “podcasts” until the words “iPod” and “broadcast” were combined to create a new term, but not by Apple. The word “podcast” describes a type of audio-blogging format that folks can soak up with their ears when their eyes aren’t available, such as whilst driving. Instead of reading blog posts and writings, podcast fans can gain the knowledge and entertainment they love via listening to a podcast. So, what is a podcast? A podcast is a series of audio files that have been published in a sharable format via an RSS feed that allows people to access the podcast online and subscribe to future episodes. A podcast is usually free to hear — similar to a radio show that you can listen to whenever you’d like to tune in, not just when the radio program decides to broadcast the segments. Podcasts represent niche topics that are of interest to specific users, like true crime aficionados or folks focused on fashion, sports, technology or a variety of other topics. In these modern days, people listen to podcasts in a number of ways, enjoying a variety of tools that weren’t always available one decade ago. Certain podcasters are even able to make money from their podcasts. Since then, the popularity of podcasts has grown so much that merely typing the word “podcasts” into Google currently results in approximately 211 million search-engine pages about the topic. Once called a new breed of popular and “free amateur chat-fests” by USA Today, podcasts are now more widely consumed — if not widely understood — by the general public. Eventually the mainstream media began to pick up on podcast listeners’ love of the digital media format, with the BBC World Service show titled Go Digital getting in on the podcast action by August 2001, and the show In Our Time showing up in podcast form by November 2004. By June 2005, Apple would include podcasts in iTunes, which allowed users to download and subscribe to their new feature. After the podcast format hit iTunes in 2005, the meteoric growth in listeners continued, with Apple topping 50 billion podcast downloads and streams, as of the last week of April 2018, according to Forbes. Thanks to additional ways to consume audio content and easy access to podcast-making tools, podcasts are becoming more and more popular. From its humble beginnings as a sort of niche tool for nerds to its current status as one of the hottest things to have in your listening repertoire, podcasts have experienced a wild ride with several iterations. As reported by The New Yorker, podcasts have become such a booming business that an ABC sitcom named “Alex, Inc.” dives into the world of podcasting. What’s Next for the Future of Podcasts? Podcast listeners are expected to double in size over the next few years, according to Digital Trends, which means the amount of folks listening to podcasts by 2025 should be monumental. The need for additional podcasts to fill the demand, along with ancillary podcasting tools, should also increase accordingly. 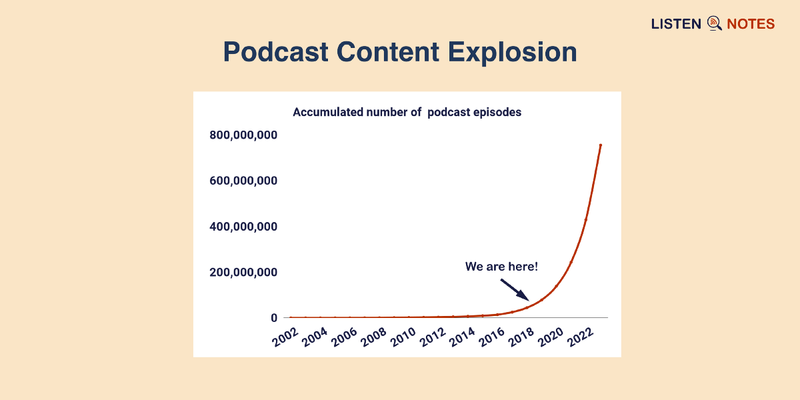 If the exponential growth of podcasts continues, expect to see — or hear about — podcasts everywhere you turn. If you haven’t yet given listening to podcasts a try, you don’t have to worry about installing apps or subscribing to shows. Simply use the podcast search engine Listen Notes to search for your interests and listen directly via your web browser.